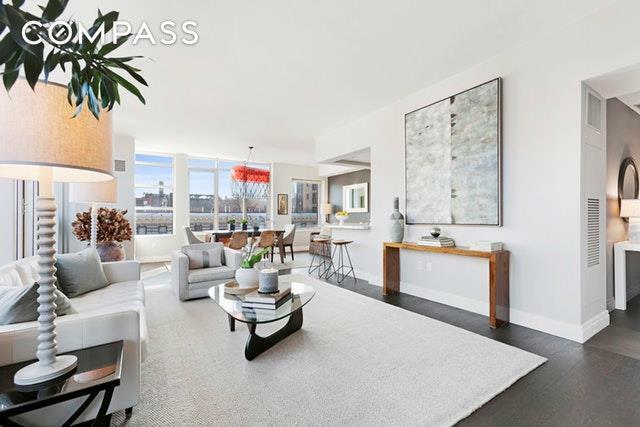 This whisper quiet penthouse apartment offers an abundance of natural light and views of Chelseas vibrant streetscape. Floor to ceiling walls of glass and steel brightens 2,129 sqft of interior living space and perfectly integrate the massive landscaped terrace into an open, modernized entertaining space.Past the gracious foyer, with full bathroom and a large coat closet, the living room is open and expansive enough for ample seating and dining options. The floors throughout the apartment are gorgeous 6 wide oak planks cured with mafi oil, a fully organic sealing process which imbues a uniquely natural wood finish. The pullman style kitchen has excellent flow and workspace suitable for a chef, with a Wolf range, Miele vented hood, Sub Zero fridge, wine cooler, beautiful marble countertops and a lovely island area with space for stools. Next to the living room, youll find a terrace outfitted with concrete paver stones, built-in floor lighting, and ringed with irrigated planters. A pocket door separates the living room from a cozy den which can be used as a small bedroom or office space. 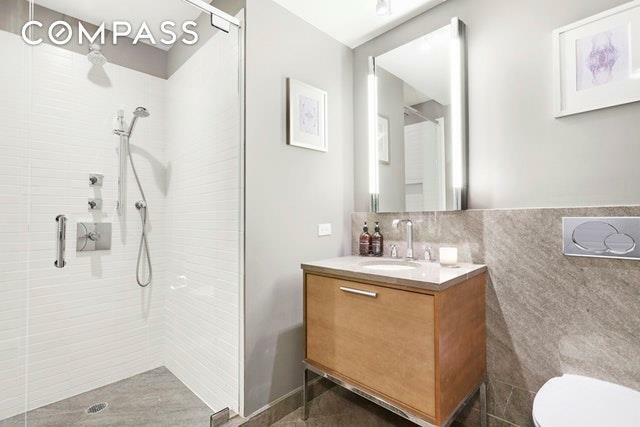 The upper level has another entry to the common hallway, a double closet for the in-unit and vented washer/dryer machines, and a good-sized bedroom with tremendous views and a private bathroom. 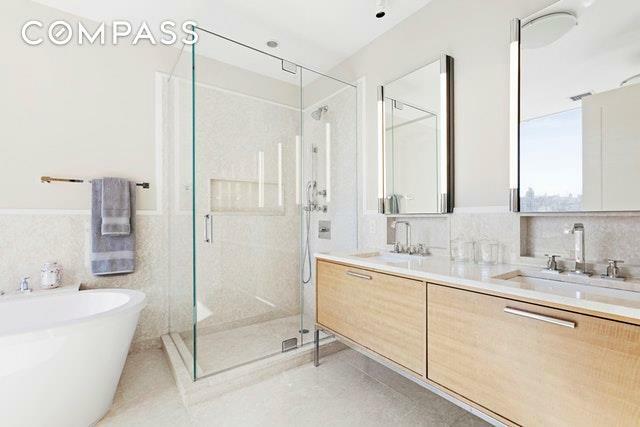 The gorgeous marble master bathroom is spacious, with heated floors, double vanity, separate marble shower enclosure and modern freestanding soaking tub, with a very large linen closet for even more storage. 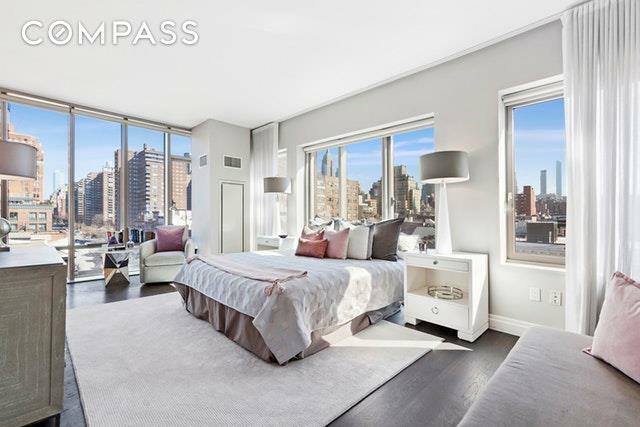 The master bedroom is enormous, featuring more fabulous views of the Empire State Building, a large walk-in closet and a separate dressing room area that could also be used as an adjoining office if so desired.Chelsea Enclave offers residents full 24 hour white glove services, a live-in Superintendent, playroom outfitted with toy sets from AppleSeed, a Gym, two stunning roof decks that can be booked for private gatherings, and garage parking spots accessible through the basement level. Perhaps best of all, the building is allowed access to the famous gardens of the General Theological Seminary, which is an amazing, fully enclosed natural retreat from the city. There is also a private storage cage for PHF in the basement. Chelsea Enclave was constructed in 2008 and now owns the land its built upon. The photo of the private terrace has been virtually staged. Listing courtesy of Mipam Thurman of Compass.